Thanks for the warm welcome, Chicago! It’s been a busy couple of weeks opening our third health center in Skokie Illinois, a part of the greater Chicago metro area, and we want to take a moment to appreciate the warm welcome we experienced from the community! 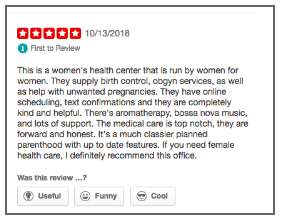 It can be incredibly challenging to open a new health center practicing abortion care. Fighting stigma and anti-choice rhetoric and policies along the way can make opening a new health center an uphill battle. That’s why we’re so touched by everyone who took a moment to welcome us to the community — from a congratulatory tweet to positive media coverage. If you haven’t seen them, check out these great pieces from the Chicago Tribune and Chicago Sun Times! We’re excited with how things are going and look forward to serving more clients in the Chicago area as well as the surrounding states. If you know someone in the who needs compassionate, convenient reproductive health care, share this post and help spread the word!